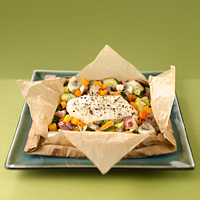 Cut off a 12-inch sheet of heavy-duty aluminum foil or parchment paper. Fold the foil or parchment paper in half, unfold, and spray with cooking spray. Center the chicken breast on the sheet. Top with zucchini, potato, onion, carrots and mushrooms. Sprinkle garlic powder and Italian seasoning over the top of the vegetables. Bring the foil together and make small, overlapping folds down the length of the packet to seal. Twist the two ends several times to make a tight seal so the liquid won't escape during cooking. Place the packet on a cookie sheet and put into the oven. Bake for 45 minutes until the chicken and vegetables are tender.